Translators in some countries do not hold the position of “certified translator”. 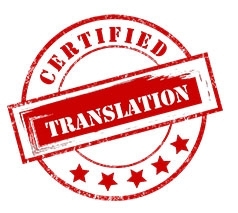 Legally certified translations are signed by a translator, and their signature is certified by a lawyer or notary public. 1) The document or text in the original language. 2) The text translated in the target language. 3) A statement signed by the translator and certified by a lawyer or notary public, in which the translator declares on oath that the translation was prepared by them, and that it is true to the original version of the document. A translation legally certified to be used in a foreign country can also need an Apostille. The Apostille is a formality in which the Attorney General’s Office certifies the authenticity of public acts (in this case, the certification of a translation issued by a lawyer or notary public). The countries that accept the Apostille are only those that have ratified or acceded to the Hague Convention. The Hague Convention website contains the updated list of all signatory and acceding countries: http://www.hcch.net/instruments/conventions/?cid=41. It is important to bear in mind that the legally certified translation includes all the documents listed above, and that none of these documents may be removed or unattached, as the legally certified translation will lose its validity. This means that if you wish to request the translation of an original document that you might need to use in the future for other purposes, you should not submit it for translation, but rather obtain a certified copy of it. A Birth Certificate, a Course Diploma, medical statements and others are examples of these documents. In short, all those documents that are difficult or impossible to obtain again, or when the cost for obtaining them is unfeasible. Please contact us if you have any further questions regarding legally certified translations: info@m21global.com.